"Through each woman's portrait, I would tell her about each incredible woman...Just the idea of her dressing like the first female pilot to fly across the Atlantic and Pacific Ocean thrilled her." Hear the whole story about how lifestyle photographer Jaime Moore decided to mark her daughter Emma's 5th birthday by recreating 5 iconic portraits of real-life role models. 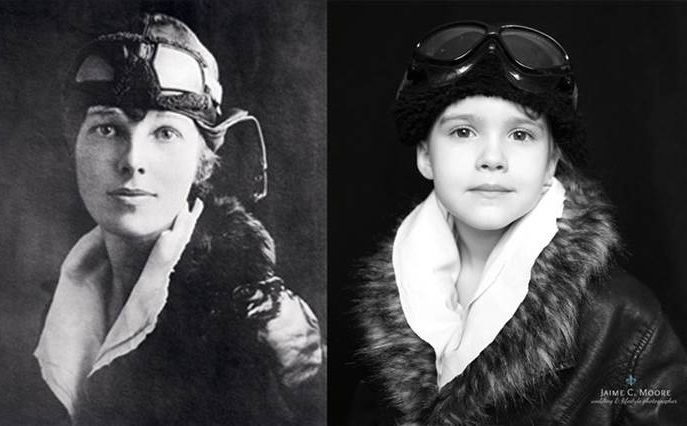 Jaime worked with her daughter to recreate iconic portraits of 5 legendary sheroes. With each photo, Jaime got the chance to tell Emma about the amazing woman she was embodying and watch as her daughter confidently connected with the character + camera. Aviation pioneer Amelia Earhart was Emma's favorite!